All mold-related matters are problematic on some level. If you see or suspect mold growth in your home, call DryAgain Water, Mold and Fire Restoration Services at (909) 337-7900 immediately for mold inspection services. Mold growth is a serious matter and should always be taken care of as soon as possible. Mold growth carries very serious risks to your health, especially if you have a weak immune system. The young and old are most susceptible. Symptoms of mold allergies include: rash, itchy or watery eyes, runny nose, scratchy throat, coughing, sneezing, etc. In cases of toxic black mold, difficulty breathing and severe coughing may also be present. Becoming sick isn’t the only thing you need to worry about. Mold growth can also cause severe damage to the structure of your home by warping, cracking, and eating away at all organic material in the home. This includes walls, ceilings, and the foundation. DryAgain Water, Mold and Fire Restoration Services offers mold inspection services to find and remove mold and keep it from returning. Our mold inspection company is first in the business and can be reached at (909) 337-7900. Give us a call to start the process of permanently removing mold from your home and bringing it back to its original condition. If you’re asking yourself “So, why should you choose DryAgain Water, Mold and Fire Restoration Services?” Consider this. We are available 365 days a year for mold remediation services. 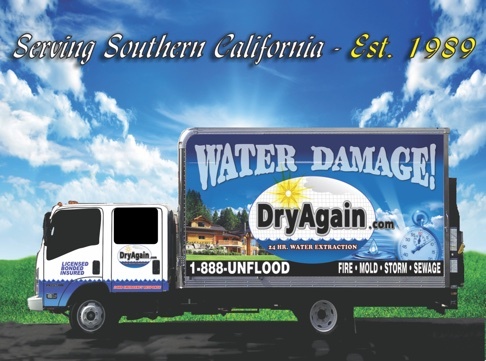 DryAgain Water, Mold and Fire Restoration Services offers a variety of Lake Elsinore mold-related services which include mold inspections, mold detection, air purifications, mold removal, and finding and fixing the source of the mold issue so it doesn’t happen again and again. Our mold inspection company has an experienced staff with licensed and insured mold remediation professionals. DryAgain Water, Mold and Fire Restoration Services uses all the latest technology and equipment to make sure that the job is done right the first time. Contact us today at (909) 337-7900 for a free estimate today!